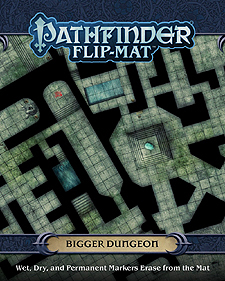 Step into a massive dungeon complete with a temple chamber, a bloodstained altar, and a ziggurat topped with a crystal skull - the possibilities for adventure are endless with Pathfinder Flip-Mat: Bigger Dungeon. With an area that's a whole 45% larger than Pathfinder Flip-Mat: Ancient Dungeon at their disposal, Game Masters can now dream even bigger! This massive gaming accessory presents both exterior and interior views of this underground complex, which can be home to everything from ancient cults to thieves' guilds to monsters that thrive in the dark. Don't waste your time drawing every dank room and twisty passage. With Pathfinder Flip-Mat: Bigger Dungeon, you'll be ready the next time your players delve the dungeons deep.